Qualcomm partnered with Microsoft for official Windows 10 support on the Snapdragon 835, which was extended to the 845 chip a year later. It seems that these Windows-on-ARM portable computers have proven successful enough to warrant a dedicated chip. 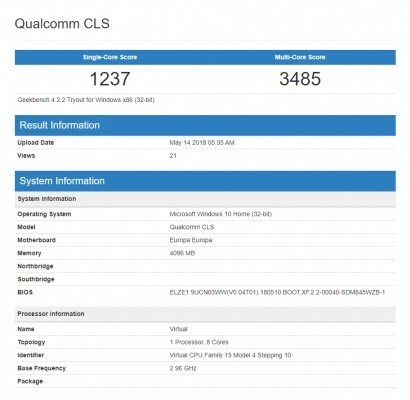 The Snapdragon 850 isn’t an entirely new chip – it’s a faster 845 – and it is aimed squarely at Windows ultra portables. It features 8 cores as before with the “big” cluster clocked higher than the phone version. The Kryo 385 Gold cores (based on Cortex-A75) reach as high as 2.96 GHz, a couple of hundred megahertz more than phone chips. This is mostly due to the improved thermals of the larger ultra portable computers. Lenovo is working on a device dubbed ELZE1, aka Europe, which will be built by Compal. HP has partnered with Quanta on the Chimera 2, while HP will be.